STATS MAN tries to improve his speech. Improving one's ability to speak in public is important in business or if you are an educator. We decided to send our field reporter to a group well known for its program that helps people speak better in public. 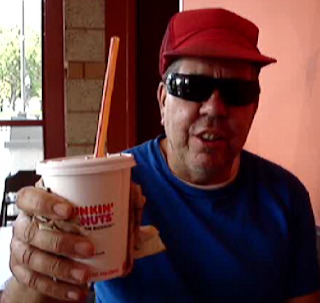 Yes, STATS MAN does Toastmasters - an ALL MY DONUTS film. STATS MAN ran into one of his fans at the Toastmasters meeting and was pleased to be recognized. However, when asked at the end of the meeting what he thought of the program, he said, "It was completely incomprehensible." That's when I knew we needed a follow-up interview to find out exactly what went on at the meeting. STATS MAN also gives us his economic plan to improve the economy. A can't miss STATS MAN video. Watch his wisdom in action. Learn. Absorb. Find truth and confusion, all in the same video. As you can see, STATS MAN knows a bit about American and Spanish. It is obvious that he does not need Toastmasters. It would only screw him up. And that's what happened when STATS MAN does Toastmasters - an ALL MY DONUTS film. You should get a JOB Roger!! !